This “ Reduce Grocery Bill: One Trick That Saves My Family $i250/Month on Groceries “ post details the one trick that saves my family a ton of money on groceries every month. How we wish we knew this trick a long time ago. This post contains affiliate links/ads. See disclosure policy. Ok, this trick is not related to couponing, getting ingredients on sale, hoarding a ton of canned goods, and others. A couple of months ago, my father and my mother-in-law arrived from the Philippines. They are now in the US and will be here for as long as they want. In the past couple of months leading to their arrival in the US, my wife and I had computed and were finding more ways to make our food budget work. By the way, we used to spend around $150- $200 each month. Here's how we do it. Oh, before I forget, I should say that aside from spending $150-200 each month before we also both saved and made money by buying groceries. Well, I should really say still save and make money by buying our groceries. My wife and I have earned over $200 since January and up to the date of this post because of using these shopping apps. These include Saving Star and Ibotta, which are by far my family's favorite shopping apps. Check out this link for the list. Before they arrived here, we had already decided to increase our grocery budget to $500 per month to account for two additional heads. While they can get jobs here and contribute to the grocery bill, we believed that they deserve to enjoy their lives here in the US since they already put in their time working and taking care of their own family for a very long time. Since they got here, our food expense per month has remained around $200 -$250 per month. Yes, our food expense has barely moved from our previous budget. Remember that the old budget was meant for just the three of us (i.e. wife, daughter, and I). I’m not kidding. Our budget remains almost the same as it was before. So, how are we able to do it? That’s the question my wife and I asked ourselves first. The answer is simple: Make and eat different dishes in one sitting. You may call me crazy. You’ll probably think, even without computing, that it’s more expensive to do it this way than just to make a single dish per sitting. I have several theories about why we are able to keep our budget almost the same even when we added two heads in our family. These non-scientific theories (haha) support my claim that it’s better to make and eat multiple dishes in one sitting to save money. The Theory Of Airplane Meal. For those who travel abroad, one thing that’s certain is that meals are given to passengers. My family travels abroad from time to time to visit our families and friends in the Philippines. Every time we travel, we get lunch and dinner meals. What is so strange with these meals is that each meal tray has a ton of foods in small portions. Even though these foods may be in small portions, they do help us get full. Often times, we end up with leftovers. My theory is that foods in small portion, when consume completely, can easily make you full. The same reasoning applies to the meals my parents-in-law prepare for us every single time. We always take a small portion of each of the dishes on the table. Next thing we know, we are done eating and we are full. The Theory of Food Varieties On The Table. My wife and I used to put one dish on the table and just went to our refrigerator for dessert. Not anymore. Since my parents-in-law arrived, we have put the main dish, the desserts, and, sometimes, appetizers on the table all at once. Of course, there are exceptions like ice cream. Because we have everything on the table, we see everything that we can eat. One thing I can tell you is that when we see what’s in front of us (food wise) and we like to try them all, our mindset will change from focusing on eating just one dish to eating all. As a result, we tend to apply the “a little bit of this, a little bit of that food” mindset. Let’s put it this way, If we already eat a lot of the first dish and we are full, there is no way that we will able to even try tasting the other foods. By getting small portions of every dish, we make sure that we have space in our stomach to eat the foods on the table. The Theory of Party Food. Whenever I go to a party, I am amazed on how much food there is to eat. I always have two choices when I see a ton of foods in front of me. My first option is to focus on few foods that I like to eat. I always go with the first option. I get overwhelmed when I see so much food. But one thing is for sure, that is, I always get full. Before my father and mother-in-law came to the US, my wife and I had always cooked one meal that had meat and vegetable in it. We always ended up consuming the dish in one sitting. My theory is that by wanting to eat a few dishes, we prevent ourselves from focusing on just one dish. Because if we do, then, we would get full fast that we won’t be able to try other dishes, which is similar to what “Theory of Food Varieties On The Table” is about. When I was growing up, I heard a lot of my friends say that it’s not a good thing to talk when you’re eating. They said that it’s somehow disrespectful. I didn’t and still don’t understand that. May be it’s just my family, but we believe that the best time to talk about anything is during meal time. It’s because we all eat at the same time. There’s no distraction when we are eating except the part when are chatting with each other. We don’t use or look at our cell phones. Our television is also off. These are some of the things that are completely out of the picture when we are eating. So what does talking do to help our family not increase our food budget? Well, the answer is simple. Scientifically speaking, your brain takes about 20 minutes before it registers that you are already full. Because we have 5 people on the table than 3, we tend to talk more on the table. This means that we give our brain the chance to tell us when we are full. If you want to read the science behind this fact, please read this link. How to make this trick work. So, you now know one trick that helps my family save more money or cut your grocery bill. I do know that some of you may still be skeptical of this trick. But if you want to try it, do you simply just do it? Not really. You have to follow some conditions or rules. Cooking one meal is, sometimes, difficult. Cooking multiple meals? Well, this might be impossible to others especially for those who always have a busy day. If you want to try this trick to save money, you have to convince yourself that you should cook multiple dishes at one time. I know that it’s not easy but with patience, continued effort, and time, you’ll get used to it. My wife and I used to have a hard time thinking what we wanted to cook and eat. I can’t tell you how many times we ended up cooking the same thing over and over. It’s a good thing that my parents-in-law are now the ones who cook for the family. To make this trick work, you need to cook different dishes. For example, don’t cook beef stroganoff, chicken alfredo, and mixed vegetables every single day. You’ll get tired of eating the same stuff every day. Don’t fret, you can always go online and search for great, easy-to-make recipes. The most important ingredient to make this trick work is time. You have to spend time making your own food. You can certainly buy from restaurants but you’ll end up spending more money doing that. If you are too busy, you may not be able to make different dishes at one time and this trick may not work for you. If you really don’t have the time, you can always use crock pots to create your own dishes. Just get all the ingredients, put them in the crock pot, and you are good to go. There are many recipes out there for crock pots that are really yummy. What have you done to cut down your grocery bills? Do you have any tips and tricks to reduce food budget you would like to share? That’s really interesting Allan – and it actually makes a lot of sense. I can see this working by adding a salad and some fruit to dinner each night too! Time is a huge factor but with good planning, it could certainly work! We’d need to come up with a bigger variety of dishes than we currently do! That’s a good idea, Vicki. Anything even a small side dish will help out a lot. Lol. I couldn’t believe it either but it really does work. 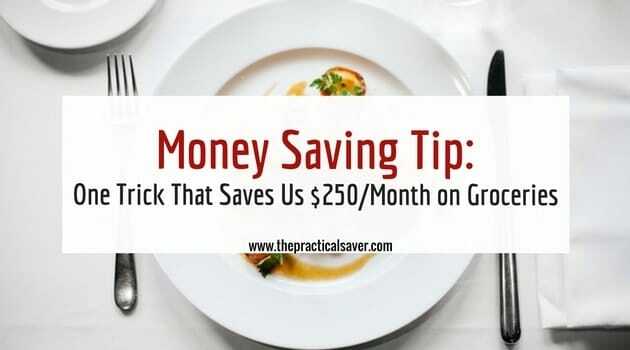 I first thought that it was impossible to save when you cook more but it has saved my family a lot of money every month. I love having a bit of variety during a mealtime. Those meals are always fun with the family. We refer to it in terms of a potluck style dinner and it definitely gets the job done. And cheaply too!